The Mexican chapatti. Made of corn or flour. Wrapped around ground meat and shredded cheese, we have tacos. Wrapped around shredded meat, lettuce, edges tucked in, smothered in cheese and sour cream, we have burrito. And Padma Di makes about 10 of them every day at home. But that is not the tortilla I am talking about. A tortilla is also a Spanish omelette. Cook a base of any veggies you want and then pour beaten eggs on it. As the eggs set, you are supposed to stick the pan inside a hot oven to cook off the top. Make sure the pan is oven safe and the top can get burnt easily. I do not have a pan that is oven safe. I do not even have an oven. Just a convection microwave. So my tortilla was simpler to cook. I was cooking breakfast one stressful Sunday morning. That particular morning, I woke up to find our gardener (no, we do not have a garden, just a few potted plants) in our living room. Shock enough for a weekend morning. Apparently, he had nothing else to do, hence decided to come to our place about an hour early. Right after that, my yoga instructor landed up, about forty-five minutes earlier than usual. On cue, the laundry guy came knocking. You can understand my consternation. Yoga failed to calm me down. So cooking was it. Late breakfast. I sliced a large onion and some button mushrooms and let them sweat in a little olive oil. Beat four eggs in a bowl, seasoned and had it ready. In about 10 minutes, the onions were nice and soft. The mushrooms released a lot of water. I poured the beaten eggs carefully and reduced the heat to the minimum. Alchemy was happening in the pan. Edge of the liquid egg was slowly curling up and began to set. The onion and mushroom mixture bubbled away with the eggs, giving it a custardy look. I was careful not to let the bottom set too much. So I took a dinner plate and deftly inverted the tortilla on the plate from the pan. And then, even more deftly, I slid the tortilla back on the pan to let the uncooked top cook and immediately switched off the gas. Let the residual heat do its thing. But by the time I could invert the omelette, the onions at the bottom got caramelised. Guess I had it on fire too long. It slid smoothly off the pan into the plate. The tortilla had a golden side and a super soft top. Sliced the tortilla in three parts. Had thick toasts with purple grape jam and great coffee ready. The first forkful had it all. The ever so slightly fruity olive oil rendered the onions to an almost jammy sweetness. The slight earthiness of mushroom beautifully complementing the sweetness of onions. The eggs, being organic in nature, more than held their own in the medley. Almost like the bass in a four-instrument band. Apparently, tortillas can have any veggies as base. And one of the more popular bases is potato. That would be next time. 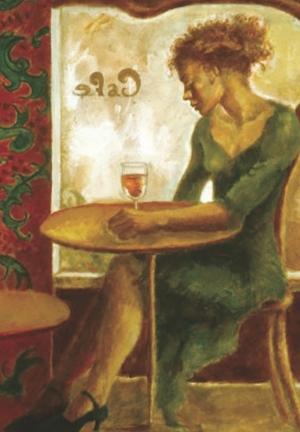 Although the afternoon didn't call for poetry, none at all, she still wanted to write. There was grey everywhere, shades of grey, dark and blue. The man across from her ordered a meatball sandwich as she sipped on her chai. She watched him finish the sandwich, which resembled a mount of cardboard. He didn't taste nor chew properly but only responded to the raw hunger beneath his sophisticated suit. A woman in a shalwar kameez walked into the cafe with her teenage son. The cafe staff greeted her. A regular. She wore a hijab and black rimmed glasses, she walked with her head held high, her voice was clear and echoed while she talked. Her teenage son, who otherwise looked like the unruly kind and even among those who would be embarrassed walking around with his mother, showed no sign of teenage disrespect. Instead, with his cool jacket and hair-do, he looked up to her, she was taller as it was and he let her tell him what to do. He followed her around the cafe, they collected their orders, gathered napkins, and when she announced it was time to go, he got up and followed her out the door. Through the window, the son was seen, a bit ahead of the mother, sipping on his mocha frappuccino with his straw. The mother was lighting a cigarette while holding her coffee in the other hand, perfectly balanced. There was no poetry, none in the air. There was a cold afternoon breeze, the kind that can kill by the night. There were leftover crumbs, dog walkers walking down cobblestone paths, and there was music. Nothing to remember, yet playing as a forced background ballad to a non-poetic afternoon. When the two girls walked in, perfectly blond and beautiful, flower-patterned short shorts over black tights, a new fashion trend that is yet to pick up, it was almost time to go. But the music changed and it was a familiar song so she decided to sip on the bottom of her cup and watch the tall blonds walk around the cafe with their carry-on suitcases. Where were they coming from or where were they off to? What could have been in those suitcases? And the random thought crossed her mind of suicide bombers, and how no blond beautiful girl would be a suspect for such a thing. Have masterminds of world destruction thought about those pawns yet? The unpoetic afternoon called for dark, gritty, damaging thoughts. The blonds had no idea, they groomed themselves, brushed their hair, strands of which fell into their coffee and they left a bit of lipstick along with saliva on their cups. The male coffee shop attendant was happy to wash it off with foamy detergent, touching the lip stains with his finger lightly before the cup was clean as new again. It got colder outside and the grey turned into black. There was no poetry in that afternoon, no appropriate song for such an hour which was as good as cardboard and canned soup, in a random place, on a random day between lunch and dinner, no poetry, none at all. It is always worthwhile to remember not to get tempted to invest in any financial organisation (whether it is a bank or a non-banking financial institution), which is offering unrealistically high returns on your investments. It is always better to be cautious now than to be sorry later. I myself was a victim when I invested in the share market and saw huge returns on my investment in the first couple of months. I was so tempted to cash my Fixed Deposits and invest more in the share market. Having been a banker for most of my life good sense prevailed and I changed my mind. I am glad I did, as we all know the market literally crashed and many investors lost all their hard-earned money. I am sure all of you must have heard of Bernard Madoff who is responsible for the 'Ponzi Scheme' and is serving jail time now. He enticed his innocent customers, some of whom were charitable organisations, into trusting him and his fraudulent scheme. I want to share this with you just so that we all know how careful we need to be in whatever part of the world we are living in. ”A Ponzi Scheme is a fraudulent investment operation that pays returns to its investors from their own money or the money paid by subsequent investors, rather than from profit earned by the individual or organisation running the operation. So you see how easily you can become a victim of temptations of getting 'much more' out of your hard earned money. Always remember to invest in reputable financial institutions where you may be getting a little less, but where your money is safe. This is especially important for retired people who have no other source of income than what they have saved over the years and the returns from these investments. This week, I will talk about a woman who lived life everyday with nature except for the days when she was away in hospital beds. Her very last day was the indication of how much she loved nature. This photo is taken just two hours before she set for her new journey. She is my mother, the one who encouraged and taught us about the beauty of and love for life with nature. My mother had a strong fascination with trees, plants and flowers. Not a single day passed without her touching the leaves and the petals in her garden. Whenever she was away from home, she always took time to visit nearby nurseries. Once, I was taking her to Apollo Hospital to see a nephrologist and on the way she asked me to stop by one of the nurseries in Bashundhra to have a quick look and to buy several pots and plants of her choice. Another time, when she was critically ill with cardiac complications, lying in a bed of the CCU at Ibrahim Cardiac Hospital, in her feeble voice she asked my sister-in-law whether the roof plants were getting watered everyday. She was as fragile as her favourite night queen. The 'night queen' plant in her balcony gifted her with its mesmerising blossom just a week prior to her departure. She almost stayed sleepless at night to witness the precious moments of the 'birth' of her favourite flowers. My mother lived her life quietly, loving and caring for her own world. Only those nearest to her knew her intense passion for nature. A plate with petals of seasonal flowers always adorned the dining table. Her roof garden has always been a place of her own. It has vegetable wings at one corner whilst the other corner is home to fruit bearing plants like kul boroi, jambura, guava, jamrul, lemon, mango and the large space is for flowers. She kept aside the first harvest for her near and dear ones -- especially her daughters and grandchildren who were away at the time. 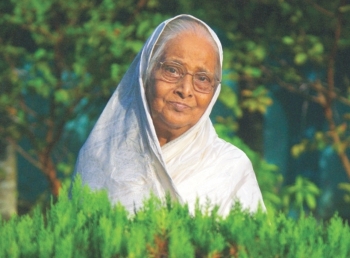 She taught us very 'deshi' techniques of caring for and protecting the plants and trees. We learnt from her that everyday the kitchen-used (obtained from washing rice, vegetables, meat and fish) water, shells of used eggs and unused parts of vegetables are good for our plants. She made sure this was given to the plants which were sturdy and needed extra care. She preserved and planted the good seeds to bring a new variety in her garden. Often conversations with her ended up with the issues of her garden, the scarcity of water, sometimes the invasion of birds and insects, rats and some time ago, the monkeys who destroyed or ate the young green fruits. Her favourite 'Shefali' tree at the entrance point of her beloved abode, 'Lutfa Garden', is now blooming with its fragrant white flowers; alas, she is not there to pick those up every morning. We laid her for eternal rest under the shade of a Mahogany tree, closest to nature as she would have preferred. Please feel free to send me emails to share your thoughts, feedback, and photos of your garden, or to tell your story; or to ask questions on issues of gardening. Greeting cards are a wonderful way of expressing wishes on any occasion. For the card giver, it is far more satisfying to send a handmade card rather than one available at the stores. For the recipients, handmade cards demonstrate that they are truly special. This week, we are going to focus on creating flower-themed greeting cards. The clear focal point of this card design is the flower. The flower is easy and quick to make. Cut out five loose circles with your fancy scissors. No guide is necessary. Try to make each circle a little bit smaller or bigger than the last. Circles that are not perfectly round work best because it gives a natural feel to your flower. Water your five cut-outs. Sprinkle a few drops on the paper until it's damp. Now the paper is more malleable and ready to bloom! Take each circle of paper and squish them in from the centre. Lay the five circle cut-outs on top of one another, and then sew together at the centre. Why not add a button to top it off? Cute! Now that we have our flowers, we are ready to attach the flowers to our card. A sheet of scrapbook paper is going to serve as our card. Fold the scrapbook paper. You can choose the shape of the card: square, rectangle, oval or circle. 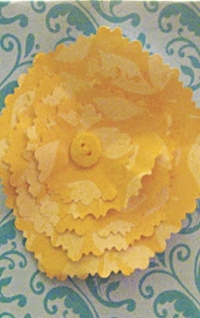 Attach the flower to the centre/side with glue or stitch it in with a thread. You can also cut a rectangle-shaped scrapbook paper as a border, as shown in the picture. Finally, write your personalised greeting and you are all set!